Donate today to help support our rescue efforts. to get approved for adoption in advance! Applications are subject to review prior to adoption. To avoid a waiting period, complete the adoption application and adoption agreement in advance and return to TCMR. You can print the forms and scan/email them back to thecatsmeowrescue@yahoo.com (or you can take photos of each page to email back if you do not have access to a scanner). You can also mail completed forms to P.O. Box 6722, Longview, TX 75608. THANK YOU! On Saturday, April 27, 2019 from 6-9PM The Cat's Meow Rescue, The Catty Shack Cat Rescue and O'Malley Alley Cat - Tyler are holding a fundraising event featuring a screening of the documentary, “Kedi,” at the Texas Broadcast Museum in Kilgore. JOIN US FOR THE FILM, FOOD, FUN AND PRIZES! <---------Click the poster to learn more! 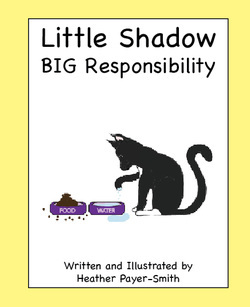 The Cat's Meow Rescue is thrilled about our Children's Book, "Little Shadow - BIG Responsibility"! This illustrated book offers a fun story and that has valuable lessons for kids who want to get a pet of their own. "Little Shadow - BIG Responsibility" is also a tribute to a very special young lady, Ally Tanzillo, whose love and passion for cats made a lasting impact on those who knew her. We are very proud to have her family's blessing in dedicating this book to her memory. ALL proceeds from the sale of this book benefit TCMR's rescue efforts. We are VERY EXCITED about this and hope that you will share with your friends and family and order your copy today! The Cat's Meow Rescue (TCMR, Inc.) is a 501c3 non-profit cat rescue comprised of local cat advocates who have come together to save cats & kittens from Northeast Texas (kill) shelters. Our dedicated team of fosters and rescuers work hard to give these cats a second chance by providing secure, temporary homes and all the necessary care and vetting for as long as necessary until permanent, loving homes are found through our cat adoption program. To TCMR, each life is precious and we take every step necessary to ensure that our rescues are given every opportunity to live happy, healthy lives. Want to stay up-to-date on news and happenings with The Cat's Meow Rescue? © 2013 The Cat's Meow Rescue. All Rights Reserved.